Oh, we hate bad headlines as much as the next guy, but sometimes it’s as if they write themselves, especially when it comes to Star Trek stuff. So you’ll have to forgive us. It doesn’t change the fact that the above Star Trek U.S.S. 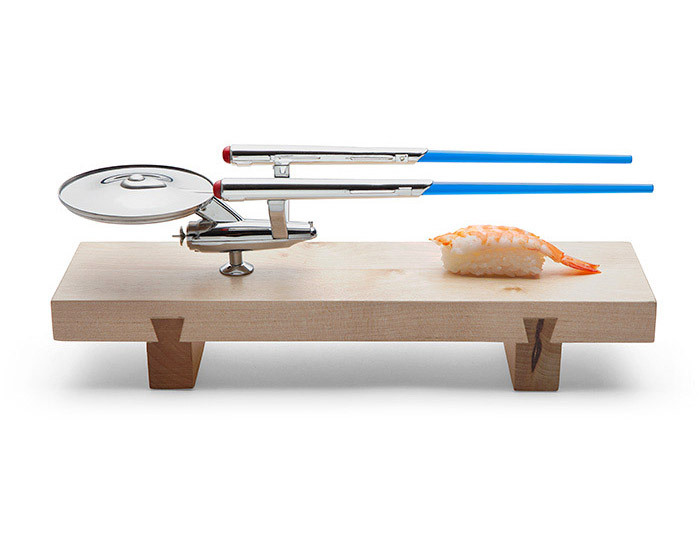 Enterprise Sushi Set is pretty awesome. 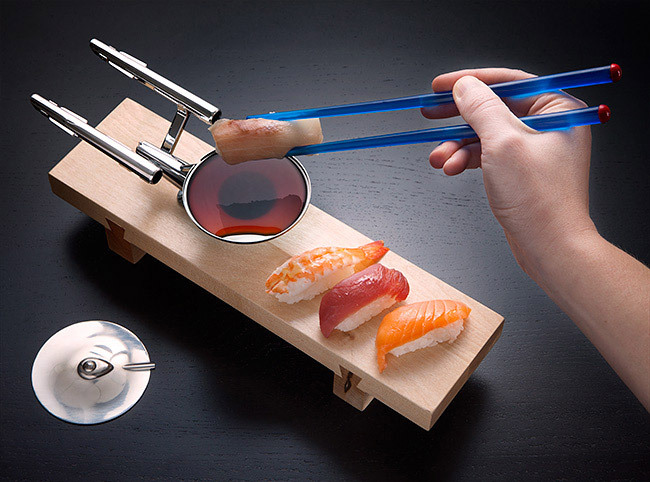 You set the food down on the wooden plate, and use the ship’s warp trail as chopsticks. The top of the saucer section comes off to reveal a sauce dish, and you can rotate the ship so that it doesn’t get in the way of your grub. Best part is that it’ll only set you back $35, which is more than reasonable for what seems to be a Thinkgeek creation and an exclusive. By Hazel Chua on 08/12/14 • Leave a comment! These delicious pieces of sushi might just knock your socks off–literally, because you’re supposed to pull them over your feet and wear them, not eat them. Each one features a sushi pattern that doesn’t look too out there when they’re on your feet, so you shouldn’t be afraid to wear them, even if you’re not big on colorful clothing or socks with loud patterns. 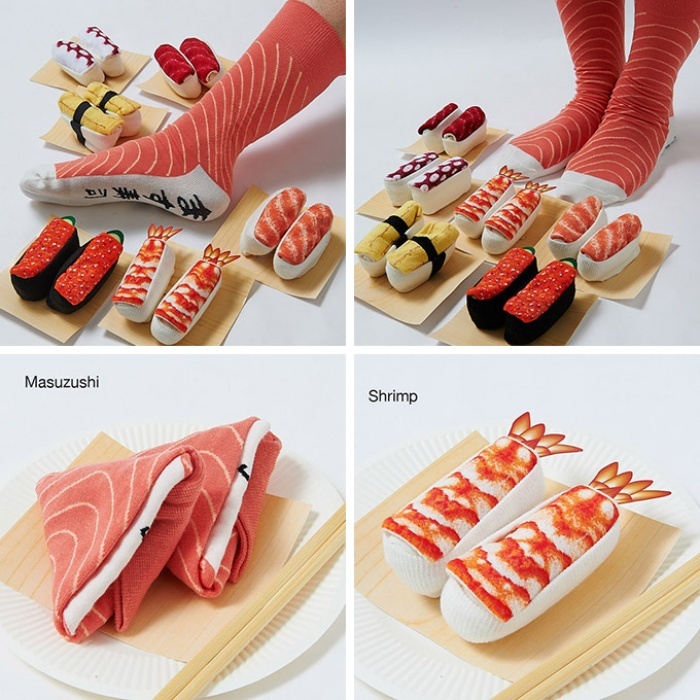 It’s a completely different story when the Sushi Socks are all rolled up and folded in your sock drawer, though, because they look just like delicious sushi! The sushi detail is knitted into the sock with colored thread instead of being printed. Seven versions are available: Masuzushi (trout sushi), Shrimp, Octopus, Red Caviar, Tuna, Salmon, and Egg. The Sushi Socks are available for $5.39 a pair. By Hazel Chua on 05/06/13 • Leave a comment! Love cats? 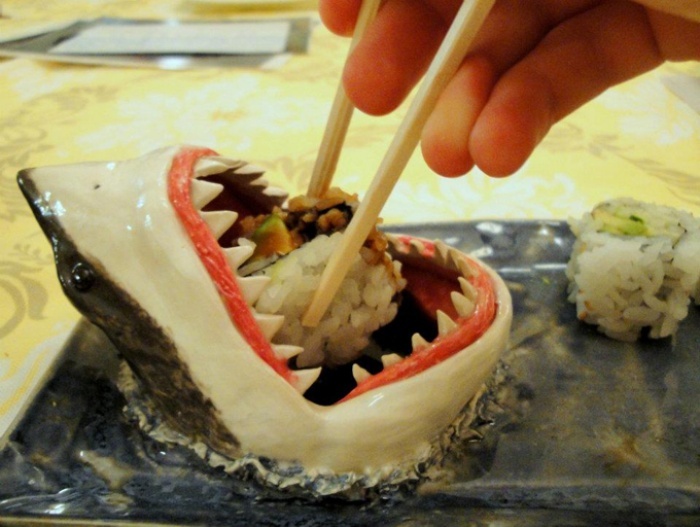 Love sushi? Then you’ll love Sushi Cats. Before you freak out and insist that you don’t find cat sushi appetizing, let me reassure you that Sushi Cats isn’t sushi that’s made from cats. 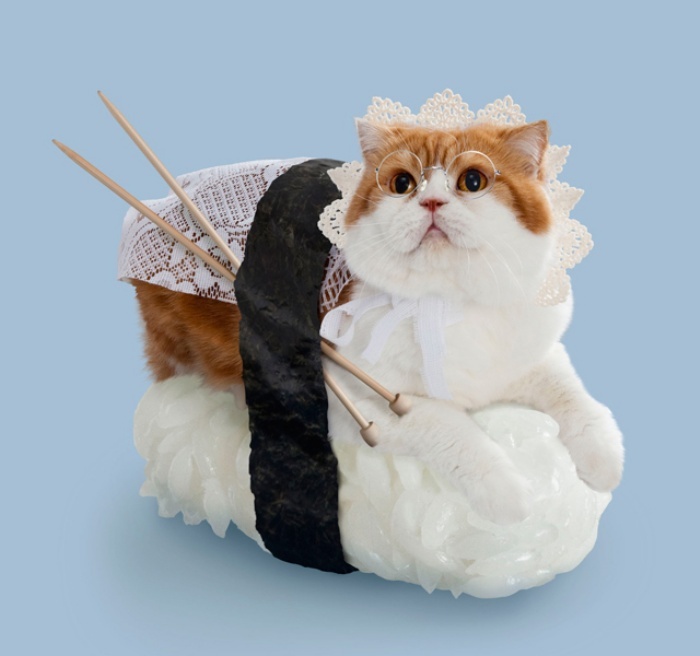 Instead, it’s actually a photo series by Japan-based company Tange & Nakimushi Peanuts that showcases the most adorable cats dressed up as sushi. 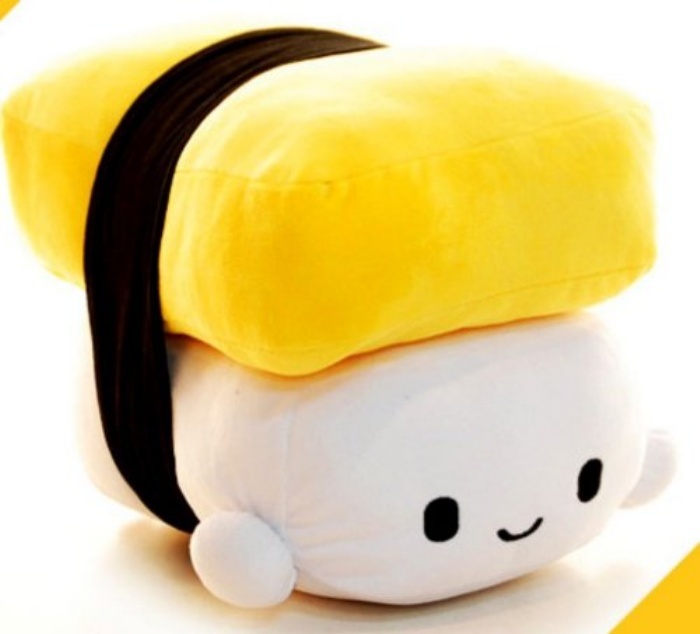 The cats are perched on a comfortable-looking gigantic rice pillow and they’re “topped” with an array of stuff, ranging from condiments and seafood to handbags and striped socks. There are more photos from the series after the jump. By Hazel Chua on 02/08/13 • Leave a comment! By Hazel Chua on 07/27/12 • Leave a comment! Despite its name, the Sushi Bazooka isn’t something that’s meant to be used during food fights. 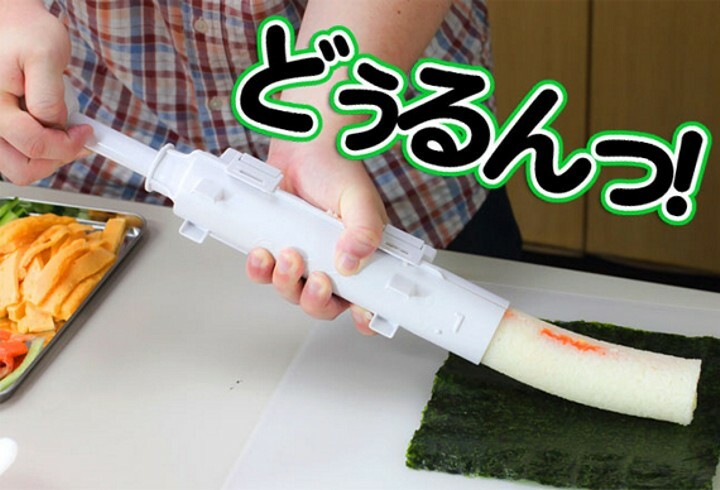 No, it’s actually a pretty nifty tool that you can use to make the perfect sushi. And if you still want to chuck it across the room when you’re done stuffing your preferred ingredients into it, then that’s up to you. Seeing as sushi originated from Japan, it only makes sense that the Sushi Bazooka was thought up by the Japanese, too. If you’ve ever tried rolling up your own sushi, then you’ll know that there’s a technique involved so you can put it together just right. But fret not, because the Bazooka is here to the rescue. It’s actually like a giant-sized frosting pump, where you’re supposed to put in your favorite fillings on the inside and rice on the outside chamber. When you’re ready, just push the entire thing onto a sheet of seaweed and roll to enjoy the perfect sushi. The Sushi Bazooka is available from Strapya World for 2,000 yen (~$25).